Setting up a successful performance management strategy begins with understanding what employees need to be productive and motivated—and they may need more than you think. Forty-nine percent of employees prefer to discuss their performance on a monthly or quarterly basis, but 22.7 percent of managers are only discussing performance “whenever they feel it is necessary,” according to my company, Quantum Workplace’s, What’s New In Employee Performance Management Trends report. 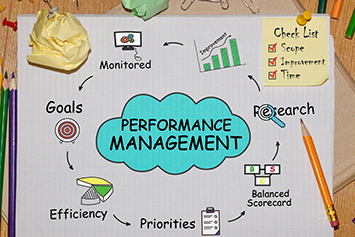 With constantly changing trends and employees with differing needs, finding a successful performance management track can be difficult. Successful business leaders already understand communication is necessary throughout their organization, but productivity is slowed when management and their teams aren’t reaching the same conclusion about how and how often feedback should be offered. When everyone is on the same page, teams are able to work more efficiently. So, it’s no surprise 60.7 percent of employees believe their performance is more likely to improve if they discuss it more frequently than once a year. What is surprising—even though managers say they only like to give feedback when they feel it’s necessary—81.6 percent agree with employees: their team’s performance will improve if they meet more than once a year. It’s not a miscommunication, but rather a lack of communication that is keeping leaders and employees from understanding exactly what they need from each other. Use an open door policy to keep discussions open and constant. Employees will be motivated to share their questions and concerns if they understand there’s a safe place to present their feedback. There’s a common misconception that leaders should be the only ones to give feedback. While 55.8 percent of managers desire feedback from peers, co-workers and colleagues may not be aware of this openness to evaluation. Not only do managers want to hear what peers are thinking, 73.4 percent find co-worker feedback valuable. Implement a 360 feedback system for your entire organization. It’s impossible for a business to reach its potential if leaders and employees don’t understand each other’s needs and expectations. Peer-to-peer reviews are a great way to get immediate feedback flowing, allows employees to recognize the hard work of others, and naturally inspires everyone to produce their highest quality of work. Many employees picture managers rushing through performance reviews at the end of the year just to say they’ve completed them. Let’s face it—after all is said and done, how much honest feedback can you give after a year’s time has past? Only 61.1 percent of employees believe managers use performance reviews to help them develop and improve professionally. However, managers don’t agree. In fact, 81.6 percent believe they do use reviews to better employee performance. This type of disconnect is holding employees back from not only performing at their best, but also trusting in the leaders of the company. Use frequent one-on-one meetings to discuss employee performance and get on the same page about expectations and goals. Employees who are able to see what they’re doing right, where improvement is needed, and how management is helping them reach the next step in their careers will be motivated to reach the peak of their success with your organization. BIO: Greg Harris is the president and CEO of Quantum Workplace, a company dedicated to providing every organization with quality engagement tools that guide their next step in making work better every day. You can connect with Greg and the Quantum Workplace team on LinkedIn, Twitter, and Facebook. Understanding the challenges and changing dynamics of recruiting should be a top priority for HR professionals today. In this Insider Report (a $299 value! ), we have curated our most effective resources on talent acquisition trends and recruiting strategies that you can use to optimize your own program and secure the competitive edge in the talent war. This free report is sponsored by RecruitCon. Copyright © 2017 Smith Consulting an HR Solutions. All Rights Reserved.